Written on February 3, 2010 and posted today as a Favorite . . .
Today we read about a people who find themselves in such dire straits that no one is to be trusted but God – not even a dear friend or a family member. I am thinking of the times in my life when I have allowed myself to be wrongly steered by companions and relatives – and this kind of miss-steering usually comes out of both their fears and my own. At times like these, Micah tells us, we are to turn to God for this all-knowing, all-seeing justice, mercy, and wisdom are the only tools we will need. They are the sole valid markers in circumstances where the culture of the day reigns rather than the spirit of God. The eternal serenity that comes from acting in humility and meekness – and by this I mean teachability – is the only remedy for extreme or grim conditions. It is painful to realize that a loved one has been lenient with us and even pampered us in fear of losing our friendship. It is humiliating to know that while we have been in a relationship of trust, a friend or kinsman has been less than truthful out of their own fear of conflict. Yet it is precisely these conditions which always offer us the opportunity to draw nearer and closer to the one source that understands us better than any person in our present life. It is only God who knows what is best to do. And we can only hear the teaching we will need for these circumstances when we allow ourselves to be teachable. 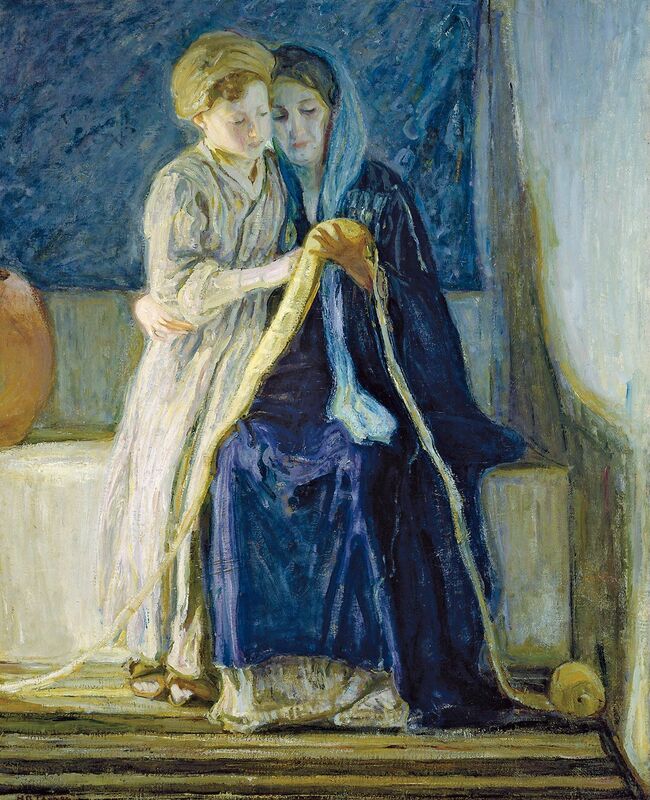 We do not often think of Christ as a child but I like to remember a painting I saw in a Baltimore exhibit of paintings by Henry Tanner. This site will show you some of his work but it does not contain my favorite . . . a sun drenched yet shady scene of the Blessed Mother with the child Jesus at her side. The scroll she is using to teach has unfurled at their feet, and they bend to their work. This is the image of Christ I hold before me when I am trying to learn from difficulties in my life. Christ looking on as his mother points to figures and pronounces their sounds. Joseph taught Jesus the craft of carpentry. This is inferred from scripture and taught by tradition. In the garden at Gethsemane Christ allowed himself to be taught by the father in heaven. As he moved toward his crucifixion he kept his mind open to the messages the humanity in him needed to hear in order to perform the tasks required of his divinity. We too, share this task of using all that is human in us to reach out for what is divine. This is difficult work and yet we must not think that we are alone in this. For the one who made us and saved us and comforts us is with us still. In all circumstances, on all days, throughout all nights, at all times. And so we pray . . . Sweet and gentle God, when we are confused and feeling lost, teach us just as your mother and father taught you. When we are exhausted and knowing not which way to turn, bring us to you, wrap us in your gentle arms, tell us how to pray, teach us what we are to do and how we are to act. We place all trust in you. Keep us ever with you. Amen. A re-post from February 4, 2012.